Amazon - instantwatcher - Nursery Rhymes 3 by Sing and Learn! 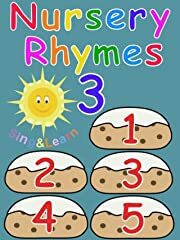 Nursery Rhymes 3 by Sing and Learn! This delightful 30 minute compilation contains many of our most popular nursery rhymes! Tasteful musical arrangements and a pleasant singing voice help adults withstand endless playings! This compilation includes 5 Currant Buns, The Grand Old Duke of York, Rockabye Baby, The Okey Kokey, Down in the Jungle, 5 Little Men in a Flying Saucer, The Wheels on the Bus, 5 Little Ducks and many more!